On a warm day in April while blading throughout Staten Island, we stopped at what they call the “P Rail Graveyard.” And let me tell you, the name is fitting of the skate spot. Here lies a basketball court-sized blacktop covered in rails from various parks and construction sites throughout Staten Island, with little to no appeal for rollerbladers. The spot was not so much a place to get clips but rather somewhere we could meet Franco before the rest of the day got underway. As Franco arrived, I noticed that the bench he was sitting on held more interest than the entire park itself. Set in front of the coastline, I arranged my shot East in order to capture a glimpse of the shore. As usual, all it takes is a simple request and Franco Cammayo performs for the camera. After two laced top souls we captured this perfectly executed fishbrain. With all of his weight on his Create Original frames, Cammayo landed fakie and rolled off seamlessly. For this shot I had one flash set up camera right and a small reflector to my immediate left. I desaturated the image to give it that cold Staten Island feel that we all have grown to love. 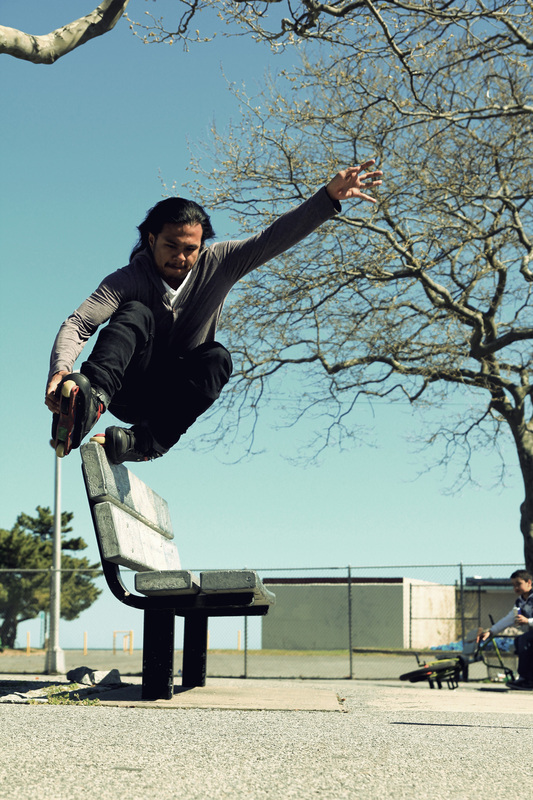 Stay tuned for more from Franco Cammayo and all of your favorite NY bladers during the official release of The 2012 Escape from New York Tour this May/June. Me too, the simplicity and how close up it is on Franco would make for a really good cover shot I think.